A most handsome pair of medals. Brett Hendey wrote: As an indication of the tight-knit community of the Natal Police, the 1922 Will of Inspector A G Abraham included a 25 GBP bequest to his god-daughter, Marjorie Lyttle, who was one of WE's children. I had intended to post a link to Abraham's biography, but I couldn't find the relevant post. Perhaps it was one of the long biographies that I did not post. 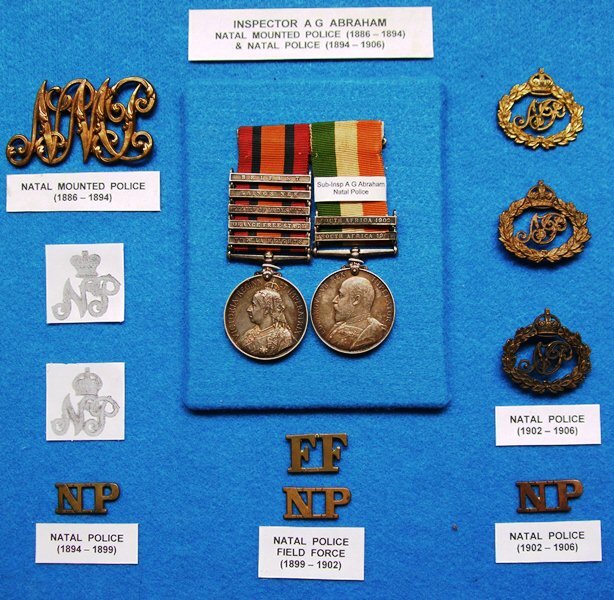 Abraham had a very 'good' Anglo-Boer War and his medals are shown below. "As soon as the news of the murder was received by the Government, a force of about 50 police, under Inspector W. F. Lyttle, was sent to Trewirgie to recover the bodies of Hunt and Armstrong. These were found on the 9th at the scene of outbreak, each with 12 to 15 wounds, but not otherwise mutilated.In the meantime, the rebels left the small bush where the police had been murdered and took refuge near by in the Enon forest. The police remained at Trewirgie, patrolling and searching for the fugitives. " I think there will be many people watching the Lyttle pair as they go under the hammer today. Lyttle's pair sold for a hammer price of £850 a few moments ago. £850 does not really sound too bad, I think I would have been happy with that price, given the recipient.